Rogers Municipal Airport in northwest Arkansas sits on 460-acres and is the home of the aviation fleet for Wal-Mart, whose corporate headquarters are in nearby Bentonville. 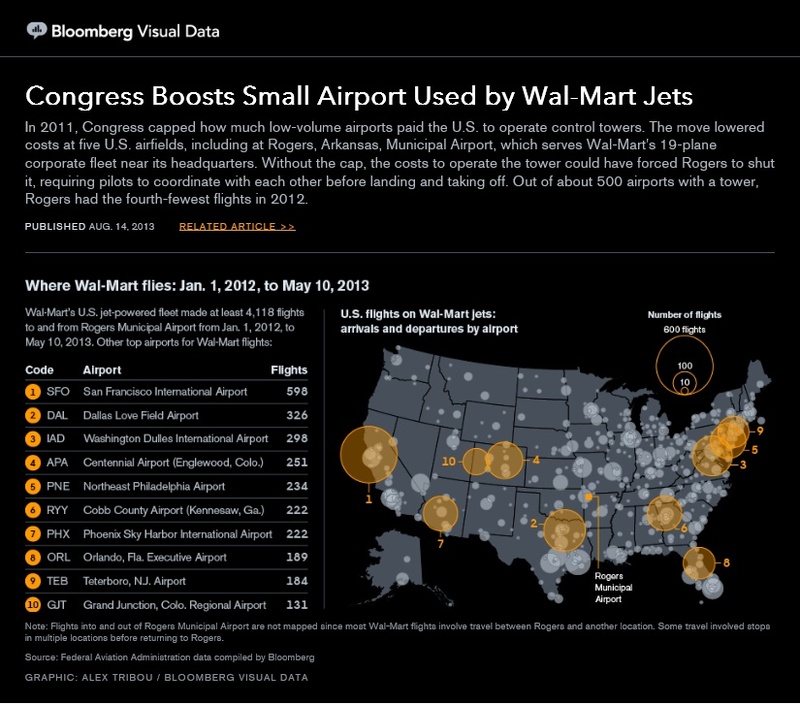 Thus, the airport is used extensively by Wal-Mart officials, as well as by vendors flying on trips to negotiate with Wal-Mart. Additionally, the airport is used for those flying to nearby Beaver Lake, which offers 30,000 acres of fishing and other activities. The airport FBO, Beaver Lake Aviation, is a wholly owned subsidiary of Wal-Mart Stores, Inc. There are 118 aircraft based at this airport, including: 73 single-engine props, 14 multi-engine props, 28 jets and 3 helicopters. A contract tower was opened in 2005 when the airport had approximately 25,000 annual operations. The tower provides ATC services from 5:30AM to 7:30PM on weekdays, and from 7AM to 9PM on weekends. FAA’s ATADS data shows that, in 2012, there were 13,933 operations (thus, 38 operations/day). This equates to two takeoffs per hour of ATC operation, or an average of 38-minutes between takeoffs. The contract for the control tower costs roughly $400K annually. Due to the very low traffic level at this airport, the airport authority is required to pay part of the ATC contract cost. Thus, in 2005, Rogers paid 31% of the contract, or $131K. Because airport operations have since dropped in half, Rogers was expecting to see their share climb to roughly $190K. However, despite the chronic gridlock in Washington, DC, lobbyists helped get legislation passed to limit the city’s share to 20%. So, Roger’s contract share dropped from $190K to $81K, while FAA pays roughly $320K annually for an airport that arguably should not even have a tower. 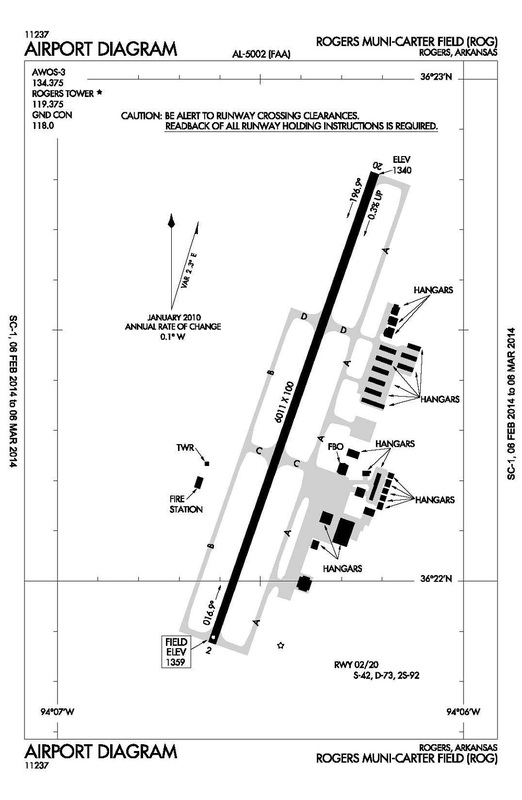 Northwest Arkansas Regional Airport (XNA) is 11-miles southwest, on 2,200 acres. This airport opened in 1998, has a contract tower averaging 113 ops/day (open 18-hrs/day), and offers commercial passenger service. Springdale Airport (KASG) is 12-miles south, on 228 acres. A contract tower is open 15-hrs/day and averages 171 operations/day, with commercial passenger flights. Fayetteville’s older airport, Drake Field (KFYV) is 20-miles south, on 630-acres. It has a contract tower, open 16-hrs/day, and handles 79 operations per day. …these three towers (and one of them is at a huge new airport, too!) all provide contract ATC at airports that are substantially underused, yet far busier than KROG. …An investigative article about the ‘exceptionalism’ of a very slow airport in northwest Arkansas, that also happens to be the home base for the Wal-Mart corporate aircraft fleet. …An interesting graphic, accompanying the article about KROG tower subsidies. Shows a map of the U.S., with the number of arrivals and departures to various U.S. airports. For example, San Francisco Airport shows 598 Wal-Mart takeoffs or landings; thus, 300 trips to KSFO during the 16-month period. A fascinating aspect of this diagram is: how serious are we about climate change and minimizing CO2 production, when we have corporations doing so much flying in business jets? Is it unreasonable to sense that Wal-Mart could ‘Spend Less. Save Money. Live Bettter. Lower Costs.’ if they would simply alter their business model to use modern communications technologies and do a lot less unnecessary flying in their fleet of corporate jets?